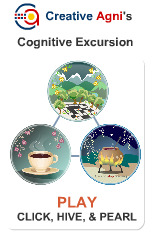 The Creative Agni eZine for Instructional Design, eLearning, mLearning, Training, and Gamification of Training & Content. Adobe Captivate Course – Starting in May, 2019. 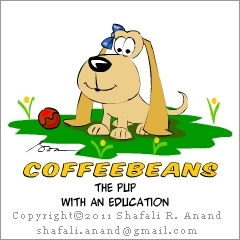 Meet Coffeebeans - The Pup with an Education. “MPs ki Loot” – Our Political Game Features in The Times of India – Sunday, April 14, 2019. “MPs ki Loot” – A Desi Game of Political Dharpakad on Google Play. The Creative Lounge :: Perfection vs. Creativity – the Destructive Chemistry between the Two. No part of this website may be reproduced in any form by any means, electronic, mechanical, photocopying or otherwise, without my prior written permission. Please visit the About section for my contact information. Creative Agni’s Corporate Trainings and Open Workshops. This post is for the Organizations and Professionals who are seeking effective training programs in the areas of Instructional Design, eLearning Development (Storyboarding and Rapid Authoring,) and Gamification of Training and Learning content. Creative Agni’s corporate training programs and open workshops are conducted in the following areas. Please visit Creative Agni’s Corporate Trainings and Open Workshops page, and if you are interested in getting a Creative Agni workshop organized for your team or if you’d like to attend one of our open workshops, please write and we’ll get in touch with you. Click to read about the workshop and register. On April 14th 2019, attend the Free TID Workshop. Click to Read about the FREE TID Workshop and Register. 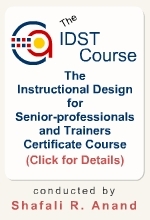 Click the image to visit the IDST Certificate Course Page. Shafali's Cognitive Psychology and Learning Blog. Copyright © 2019 Shafali R. Anand | Creative Agni – Instructional Design Articles, Trainings, Workshops, and the ID & eLearning eZine by Shafali R. Anand (Creative Agni is located in Noida, Delhi-NCR, India.) All Rights Reserved. The Instructional Design Courses by Shafali R. Anand (The IDCD Course and the IDST Course) are conducted at Noida - Delhi NCR, India.